That’s a crib. In our house. In our bedroom. The first day waking up to the crib in our room was such a trip. In a few months a little baby will be living here with us. We decided with our current living situation and for ease of night feedings that Baby Barker would room with us for at least the first 6 months or so. So her nursery is now a “nursery nook” in our bedroom. Our plan is just the crib and then a changing pad on top of our dresser. Original plans included a glider, but once we moved into the new room we’re be sharing with baby girl we realized it might be a bit cramped. So we’re going to give life without a glider a try and see how it goes!For now my projects for the “nursery nook” are to put some art (some pieces from my sister pictured) on the wall above the crib, make a little mobile for the crib and create an organizing system for all her baby things in our closet and linen cabinets that are in the room. 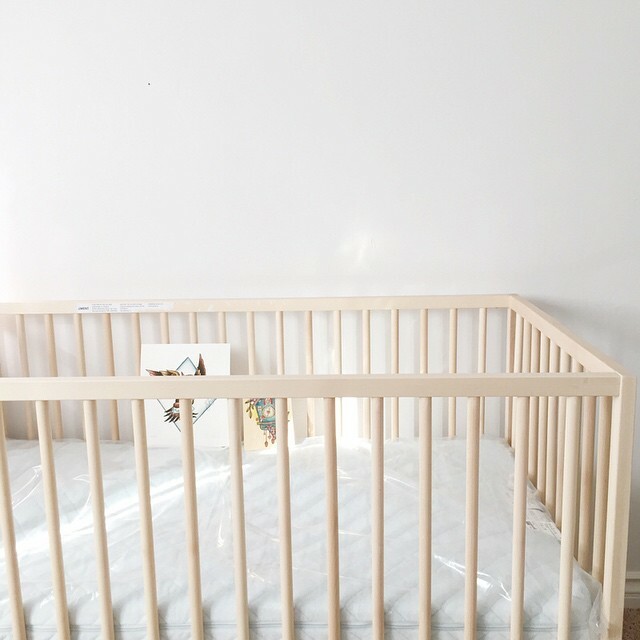 I’ll definitely be sharing progress as we move along, but I was just excited to share our new room, freshly painted an just barely there grey, with a little baby crib next to our bed.